At ebay.in you can purchase BOAT BASSHEADS 225 IN-EAR SUPER EXTRA BASS WIRED HEADPHONE WITH MIC(BLUE) for only Rs. 529, which is 22% less than the cost in Flipkart (Rs. 680). The lowest price of boAt BassHeads 225 Wired Headset with Mic(Blue, In the Ear) was obtained on April 11, 2019 6:24 am. 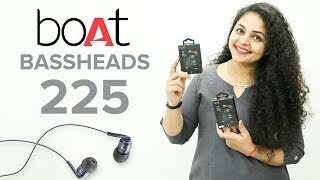 BoAt BassHeads 225 polished metallic earphones are intended to supply you with an experience that no other brand can match. With tangle-free wires, you’re expected to be more hassle-free. As the earphone features 10mm drivers, they provide you clear audio with this thumping bass. In-built noise cancellation feature ensures you don’t miss those important calls. With colors that match your personality, the boAt earphones are the perfect selection for anybody who carries that style.